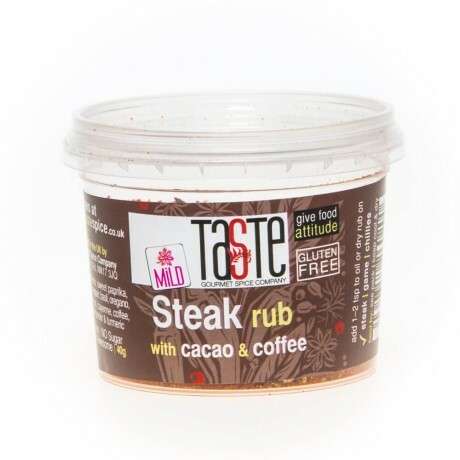 This is an incredible seasoning for steak and other red meat: it adds levels of flavour with its complex range of spices, yet doesn’t overpower the flavour of the meat. Both coffee and pure cacao enhance the meaty flavour of red meats, so we put both in our Steak Rub to really give your steak attitude! You don’t need to use much – either dry rub a teaspoon amount onto your steak or add a splash of oil to really get the flavour moving. Then simply pop it on the BBQ or a ferociously hot (dry) griddle pan for a few minutes each side, leave to rest for 5 minutes and enjoy the tastiest steak you’ve ever tasted! But it doesn’t just stop there – try a spoon in a stew or a casserole as well for extra depth and a really rich sauce.